EndTime Issues ... : An Urgent Perspective! Jesus could come any time (unaware of what lies ahead). Nothing has changed in the last 50 years. The apostles anticipated the end centuries ago. Is their restricted orientation still a safe conviction to lean on? Do we assume that most apocalyptic prophecies have been fulfilled – and thus the Second Advent is presently anticipated? Do we identify with Solomon’s cadence of thinking? “What exists now is what will be and what has been done is what will be done, there is nothing truly new … [under the sun]” (Ecclesiastes 1:9 – NET). The structure of Biblical end-time prophecy is unique and summons conscientious attention. If studied, their narratives actually shrink 2000+ years of time into the present. There is now an urgent, tangible perspective that God’s word beckons us to understand! There is endless debate as to what part of Matthew 24 was meant for the fall of Jerusalem and which portion is for the Second Coming (parousia). When a comparison of that Olivet rendition is made with Mark 13 and Luke 21 (especially), it can be concluded that most of Christ’s reflective projections are of immediate interest. End of the world (Matthew 24:14), when the gospel has spread globally. That is a God sign – not a man sign. Signs revealing the end is very soon (Luke 21:28, 31) – within a generation. Signs announcing the end of man’s waiting for Jesus (Matthew 24:27, 30-31). The greater purpose of the Olivet discourse wasn’t to create a montage of opinion and speculation over its content. A proper analysis puts into motion a myriad of objective observations. 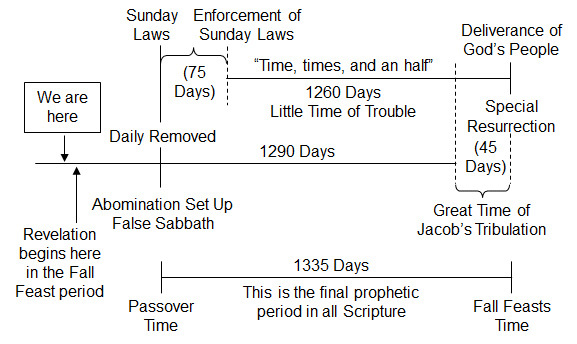 One fascinating prophetic morsel: The sequence of events is a template for all end-time prophecy! Christ’s discourse to four of the disciples (who were not the ones writing about it – interestingly) is a “cookie-cutter” to “clarify one’s understanding” against all other apocalyptic prophecy. “And when these things begin to come to pass, then look up, and lift up your heads; for your redemption draweth nigh…. So likewise ye, when ye see these things come to pass, know ye that the kingdom of God is nigh at hand. Verily I say unto you, This generation shall not pass away, till all be fulfilled” (Luke 21:28, 31-32). Are these prophecies beginning to be fulfilled? Anything less than an objective “Yes” is of concern. “When ye therefore shall see the abomination of desolation, spoken of by Daniel the prophet, stand in the holy place, (whoso readeth, let him understand:)” (Matthew 24:15). This is of immeasurable value. In fact, the most important timing information of end-time prophecy is couched within these narratives. Here, one learns that the end will be a war between Christ and Satan (ram and he-goat) (Daniel 8:38). God identifies two groups of people who are loyal to Him (Daniel 8:2-12) – a small group and a large group – in that order (living horns on the ram). The rise of the antichrist is depicted as a “little horn,” a “king,” a “vile person” and, finally, the “king of the north” (Daniel 8 and 11). That “person” is arrogant and defies the “prince of princes,” Jesus Christ – the ram of God (Daniel 8:25) – previously called the “prince of the host” (Daniel 8:11). Point 67. “Therefore, also in the particular circumstances of our own time, Christians will naturally strive to ensure that civil legislation respects their duty to keep Sunday holy.” Dies Domini, May 31, 1998. These are appeals for a Sunday law – change of times and law. 2000 (August 6): Dominus Iesus by Cardinal Joseph Ratzinger (later, Pope Benedict XVI) was published. Writing as head of the Congregation for the Doctrine of Faith, he defended the Church’s claim for “absolutions” and firmly noted that salvation is through the Church only – countering Paul’s assertion in Acts 4:12. 2014 (June 25): Pope Francis affirmed this position in a homily. He further stated that salvation cannot be obtained without the intercession of Mary – a dogma totally at variance with the Bible. In November, 2013, Pope Francis published an “apostolic exortation” in which he stated that the global economy was about to collapse. He appealed for a Roman Catholic solution, first outlined in Rerum Novarum, 1891, by Pope Leo XIII. Francis is vying for a geopolitical leadership role (noted in Daniel 11:40-45) for a new world order. Pope Benedict had also anticipated clearly an end-time role the Church could have in his encyclical Caritas in Veritate (“Charity in Truth”), published on July 7, 2009. Pope Francis is also vigorously moving forward to be the head of a one-world religion. Jesus not only tied Daniel’s narrative to the end of time – the generation that would see His return – He introduced timing prophecies directly related to that Olivet discourse! Daniel 12:11 has a word-for-word identity with the “abomination of desolation” within the Greek Septuagint with Mark 13:14. When the word “day(s)” (yom – H) is used with a number (ordinal or cardinal), it always refers to a literal 24-hour period! The beautiful beatitude related to the 1335 days (12:12) can apply only to an individual within his lifetime, and therefore cannot be 1335 years! “The Revelation of Jesus Christ, which God gave unto him, to show unto his servants things which must shortly come to pass; and he sent and signified it by his angel unto his servant John” (Revelation 1:1). Authority of its information: God the Father is the “Source” (Revelation 1:1). Christ is then the agent for its transmission. (Matthew 28:18; cf. John 3:5, 5:27, 13:23, 17:2). b. He makes known everything He hears from the Father (John 15:15; cf. 1:18, 8:28, 12:49-50, etc.). Time: It must shortly come to pass (Revelation 1:1). a. This relates to Daniel 2:28-29, 44-45 as to what must come to pass in those days. c. The imminent end of history is a constant theme in the Book of Revelation. Not immediate – but within the context of the message in the book! Key! Thus – when Jesus says, “I come quickly,” it’s the same word (2:16; 3:11; 11:14; 22:7, 12, 20). It means “within the fulfillment of the prophecies noted” – there will be no delay. “Blessed is he that readeth, and they that hear the words of this prophecy, and keep those things which are written therein: for the time is at hand” (Revelation 1:3). This is the second time John notes that what’s in this book is about to occur. Now it can be seen as a warning. In Revelation the word “near” appears twice – and each time with the word kairos (“time”). Hebrews 10:25, James 5:8, I Peter 4:7). “Get ready, get ready, get ready, lest ye be weighed in the balance and found wanting.” Why? Time is almost finished. What then is so near contextually, in chapter 1? Are Revelation’s prophecies unfolding? 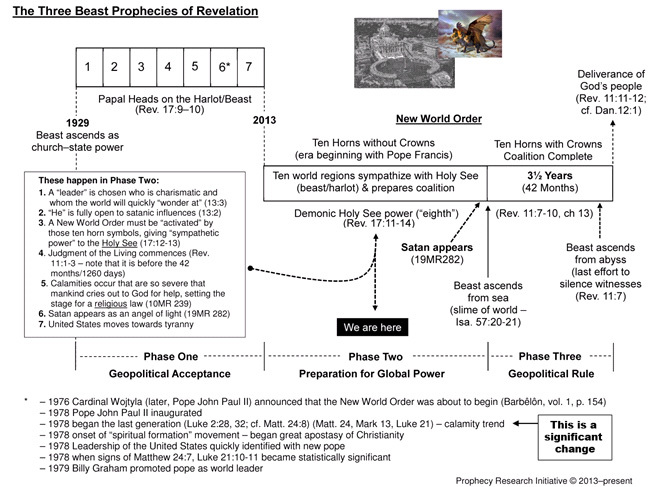 The following is a graph of the three antichrist/beast prophecies in Revelation. Phase One is history. We are in Phase Two, where world powers are merging into a coalition with Rome. It is real and being driven by major leaders around the globe. (Study Manuscript Releases, vol. 19, p. 382.) Satan as an angel of light is soon to emerge as earth’s “Savior.” This is why Christ warned repeatedly about false Messiahs in Matthew 24. The messages of Revelation 10 are counsel on how to get ready to be God’s witnesses – that “little book” must be understood. The three angels’ messages are an outline of what will shortly be conveyed to planet earth in its final evangelical outreach! That “judgment hour” ties to Revelation 11:1. Many reports are hitting the press that Obama and Pope Francis are working closely together (e.g., Francis was instrumental in the U.S. and Cuba’s new relationship). A major drive by Rome to speak against capitalism and urge the centralization of world finances into a single bank is moving forward. This is a prerequisite to Daniel 11:43. The Pope will address the U.S. Congress, United Nations and the Protestant Alliance this fall, while leading out in the World Meeting on the Family in Philadelphia (intriguingly, during the Fall Feasts). Their last “Family” meeting emphasized Sunday rest. Francis is urging Obama to keep the United States–Mexico border open. The terrifying moves of ISIS are part of developing region 7 of ten divisions of the New World Order. Their anti-Christian terror reflects the King of the South pushing against the King of the North (Daniel 11:40-41) (over 300,000 martyred so far). We could fill pages of current events as to how prophecy is being fulfilled related to the papacy, world geopolitical order, Islam, the United States (growing tyranny) and the economy. Shortly, at a fall Feast of Trumpets, dramatic events will transition for God’s people – a countdown will then begin for the 144,000. For those functioning as though there is a delay, begin looking at Biblical details. For those expecting the end any day now, look at the great prophetic periods, which cover four years, leading up to the deliverance of God’s people. That will be a very solemn time. For those perceiving “life,” “events,” as usual, a painful surprise lies just ahead. In January of this year, during Pope Francis’ return flight from his dramatic visit to the Philippines, he held a news conference, telling reporters to read a 1907 book, Lord of the World (Robert H. Bensen), to understand what is now occurring. An antichrist will arise – totally hard-hearted and totally kind (Pope Francis?). Then a world leader will arise whom the world is fascinated by, yet knows very little about (President Obama?). humanism (Revelation 17:12-13) (social doctrine Francis trained in?). Marxism will become the ideology of a World Order. That pope goes to the Holy Land to lead the world and bring peace (Daniel 11:45a?). Then the world will turn against Rome – the pope (Daniel 11:45b, cf. Revelation 17:14). Can you see what Bensen and Francis have conveyed? This is an urgent perspective. Eternity is not too far away. White, Ellen G.; The Youth Instructor, August 25, 1886. White, Ellen G.; Testimonies, vol. 5, p. 716. Bock, Darrell L.; Luke 9:51–24:53 (Baker Academic, Grand Rapids, MI; 1996), p. 1691. Pope Benedict, Caritas in Veritate, pp. 142-143. Gerhard, Hasel; Symposium on Daniel, Biblical Research institute, General Conference of The Seventh-day Adventist Church. Osborne, Grant R.; Revelation (Baker Book House; Grand Rapids, MI; 2002), p. 54. Thomas, Robert L.; Revelation 8–22 – An Exegetical Commentary (Moody Press, Chicago, 1995), p. 54. White, Ellen G.; Manuscript Releases, vol. 5, p. 253 (1851) and vol. 8, pp. 222-223 (1850). Fowler, Franklin S.; The Last Geopolitical “Order” (Christian Heritage Foundation, Lucerne Valley, CA). Washington Times, December 30, 2014. World Net Daily, February, 2015.